My daughter and I love playing board games together. This started when she was little and we’d play Hi-Ho Cheerio and Candyland. Hint: if you ever play Candyland with a small child, be sure to hide the card that sends them all the way back to the beginning. Inevitably they will get it instead of you and there will be tears. It’s not worth it. As she got older, we graduated to harder games, from Payday to Monopoly to Scrabble. It’s a great way to be chummy together – you can talk or not, and the chit chat can be light or serious. I often found that if I could outlast her (around midnight or so), I’d start hearing the really good stuff. It was worth being tired at work the next day! 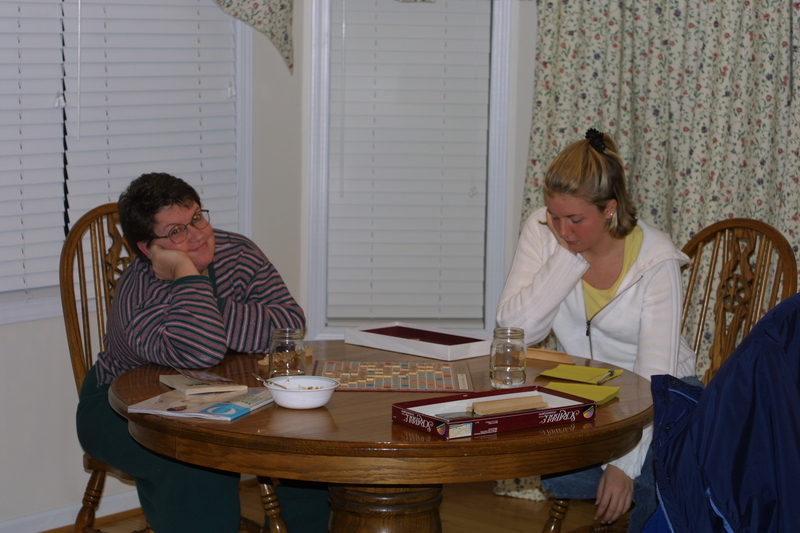 Of course, these days she has to work too, so we don’t often stay up so late playing Scrabble. As our relationship has evolved, I also don’t have to wait so long to hear the good stuff either. We have a more solid and less judgmental relationship – going both ways – and we share a lot of things even without a board game between us. Here I am waiting. . . waiting. . . waiting. . .
Word for tomorrow – LUCKIEST. If you prefer to work ahead, see the list for the week under “A Word A Day”. My Mom found it pretty amusing too. You know, when I started this, I wasn’t sure what to expect for my friends reading it. I am so thrilled that you signed up for the E-mails and that Jaimie loves it so much. I really appreciate your comments letting me know when she’s liked a picture. We love playing games, too. Now we play games like Settlers, and Star-farers. More complicated and more interesting for us. I hadn’t heard of those two games – I’ll check that out. I’d love to get Scrabble for my iPad, but the reviews are pretty bad for it. I’ve been doing Kakuro instead. I love that game. I played a game of scrabble just this afternoon with my husband, while he was watching a World Cup qualifying match on TV. I like that we can avoid any ‘big issues’ while just enjoying the game. That’s what I always liked about it too – being able to spend time together without having to argue or discuss things we’d rather not. So who won? We have this in common too! My daughter and I are currently hung up on Bananagrams. We delight in playing it night after night when we’re on the same coast. We really do have so many things in common! You’d talked about the Bananagrams before – I’ll have to look for it. We could use a few new games.